Beehive: The 60s Musical. Photo courtesy The Pollard Theatre. Beehive: The 60s Musical is the ultimate celebration of female empowerment, music, fashion, and hairdos that defined an era. The 1960s were a time of great change for American history, and with it came some of the best music by the most iconic artists. Beehive celebrates these feminine revolutionaries and features some of their most recognizable tunes. Audiences will love hearing “My Boyfriend’s Back”, “Son of a Preacher Man”, “Me and Bobby McGee”, “Natural Woman” and more. Timothy Stewart directs this revival production, which is returning to the Pollard after its original run in 2008. Jennifer Teel and Stefani Fortney are also returning to reprise their original roles. Beehive also features Susan Riley, Megan Montgomery, Mariah Warren, and De’Vin Lewis. 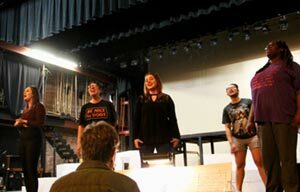 Teel and Fortney have also been seen on the Pollard stage in Passing Strange, while Montgomery was recently in Heathers: The Musical and Disney’s The Little Mermaid. Pollard patrons will recognize Riley from Disney’s Beauty and the Beast, and De’Vin Lewis was featured in Ghost: The Musical and The Color Purple. Mariah Warren is known to Pollard audiences for her roles in Ghost: The Musical, and Heathers: The Musical. These leading ladies will sing songs by Diana Ross and The Supremes, Tina Turner, Janis Joplin, Aretha Franklin, Dusty Springfield, and more. The cast of Beehive: The 60s Musical. Photo courtesy Pollard Theatre Company. Beehive: The 60s Musical features scenic design by James A. Hughes, costume design by Michael James, and lighting design by Michael Long. Wig design is by Hannah Finnegan. Dakota Muckelrath serves as production stage manager. 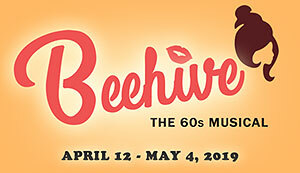 Beehive: The 60s Musical is presented by Jeff and Carol Hirzel and Buck and Sharon Adams at The Pollard Theatre, in historic downtown Guthrie. The production runs April 12th-May 4th. For tickets, visit thepollard.org or call the box office at 405-282-2800. The Pollard Theatre is the perfect outing to the theatre, and the historic building is a beauty amongst the towering brick storefronts at 120 W. Harrison Ave.